When midnight hits, you will be ready to party with the Golden Midnight New Year's Eve party kit! 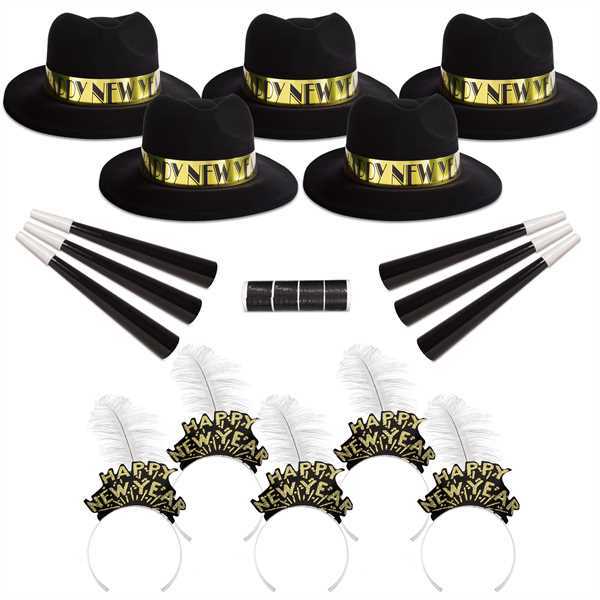 Designed for 50 people, this classic party starter includes 25 midnight black velour fedora gangster style hats with gold band accents, 25 "Happy New Year" gold glittered tiaras with white plume feathers, 50 8" black foil horns and 200 serpentine throws. This unimprinted kit is a great way to unbox an instant celebration at any event or occasion!